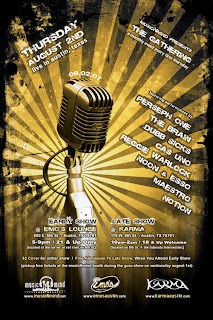 e Brain, Dubb Sicks, Cas Uno, Reggie Warlock, Noon and Esso, Maestro, and Notion... all in one night, August 2nd. Heading out to Miami on Thursday for a bachelor party, we're taking a cruise out from Miami. My buddy who planned it does alot of Music Masala cruises, so I'm afraid that we're going to be groovin with a bunch of uncles and aunties.